These really cute handbag and shoes decorated sugar cubes are sure to be a big hit at your next tea party. Everyone will love this assortment of purses and shoes decorated sugar cubes. They come boxed in an assorted set of 18. Great for bridal shower teas. 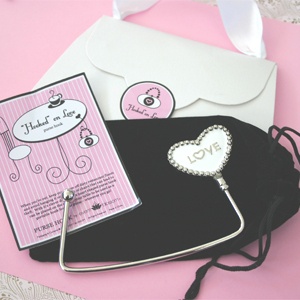 These heart love purse hooks are great gifts for your bridal party and bridal shower favors. Get your girlfriends "hooked on love" with these ultra hip fashionable purse accessories. Stop carelessly hanging your purse on the back of restaurant chairs! Now you can keep your purse close and secure, off of the floor...with style. Place this gorgeous heart shaped hook at the edge of a table to use as a cradle for your purse---wherever you go! The heart shaped purse hooks have a detailed silver metal beaded trim and white enamel in the center with the word "LOVE" delicately displayed in the center. Ideally packaged in a purse shaped envelope with a white ribbon handle, this perfect gift is completed with a trendy pink and black "Hooked on Love" label. As a bonus, included is a handy velvet bag to store your purse hook in and a card on how to use the hooks. Price is per love purse hook. Minimum order is 6. Size of Packaging: 6.25" x 4.5"